After a day walking around the Topkapi Palace or rubbing shoulders with hundreds of other visitors in Istanbul’s Grand Bazaar, what better way to relax than by having a Turkish bath? The most convenient place for travelers, and also the most famous, is the Cemberlitas Baths, the entrance to which is just outside the Cemberlitas tram stop. I had plenty of time to read about the various options they offer (In English) at the entrance as the three Italian ladies in front of me all wanted the “Luxury” option, costing 90 Turkish Lira (USD$50), and paid individually by credit card. I decided upon the “Traditional” option, costing 55 Lira, and paid in cash, receiving in return a folded scrubbing mitt enclosed in plastic and a towel called a pestemal that would cover my middle third. I was directed straight ahead whereas the ladies have a separate entrance to their changing rooms, steam room and showers. I crossed the entrance hall or camekan and headed up the stairs. I was greeted by the changing room attendant, Omar, who was the only person I met in the baths who didn’t solicit for a tip. I was on the lower of two levels of individual changing rooms called halvets that were locked with a key, which had a loop attached that fitted snugly and securely over my wrist. Having changed into my towel and some loose-fitting wooden sandals, I felt very pale all of a sudden. Omar indicated I should go back down the stairs where I was directed through one door into the shower and warming down area. Here people were sitting around having shoulder massages, drying themselves and sitting still with their eyes closed. The door to the steam room opened and I clip-clopped through the slight haziness into the huge domed room. An attendant pointed to where I should lie down on the circular central slab that was 30 feet in diameter. This is called a gokektasi and is directly above the heating source. There were around 20 customers and 5 attendants. I laid down on the slab and started to stare at the ceiling and tried not to feel too hot as I gradually melted into the marble. 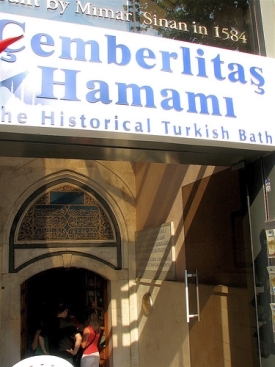 This steam room was built in 1584 and like the rest of the Cemberlitas Baths was designed by the great architect Sinan, who designed many of the mosques in Istanbul. Fountains around the edge contain water to help people cool down if they feel they can’t cope with the temperature. All around I heard people being washed, massaged, slapped a little, scrubbed and sloshed with water. I lay on the vast hot marble slab and sweated profusely for 15 minutes, occasionally dowsing myself in cool water from a metal bowl filled from the fountains. I held the mitt I was given at the entrance all the time as this would be used by the attendant to clean me. There are holes in concentric circles in the ceiling to let the light in and I became almost mesmerized by trying to count them all. I think there are 132 in eight circles but I might be wrong. Then all of a sudden it was my turn to be bathed. “Sit,” came the command, and I obediently sat on the edge of the slab, but my mind was still on the holes in the ceiling, and I was still looking upwards, so the bucket of colder water that drenched me came as quite a shock. “Oooer,” I think I said. “Good?” said the smiling attendant. I told him I was from England though I lived in Canada. The Turkish Maradona nodded his head in approval and then indicated that I should lie down flat on the edge of the slab. I gave him the mitt and he pointed to the metal bowl and mimed putting it under my head. Then the self-styled Turkish Maradona got to work. He cleaned me with the mitt both on my back and on my front. This was done quite gently moving in vertical sweeps along my torso and my legs up to my thighs. He then went to get a large metal bucket and used some of the contents to cover me in soapy water and he massaged me really well back and front, firmly extracting all the dirt that has built up over the day with his fingertips. By the end of this I was sliding around on the marble as though I was on ice. When I was on my front, he made me stretch my arms above my head and he flattened them slightly against the stone and pulled my wrists upwards which really felt very invigorating. He also massaged my back quite hard running his hands upwards from my waist towards my neck three or four times. Maradona then got me to sit by the water fountain for 5 minutes to sweat a little more. He cleaned the area where I had just been lying with two buckets of water before walking around the slab and chatting with some more attendants. He was soon back. He grabbed my head quite firmly and began to wash my hair with the mitt. He had the flat of his hand pressed against my forehead and washed my head with the other hand. Some soap got up my nose so he threw a bucket of water over my face. With both hands he then rubbed my head vigourously with more soap and massaged my upper back, neck, and shoulders. I was rinsed twice and soaped again before he finally emptied three buckets of cooler water over me in quick succession. They were so invigorating. Then the fun really began. He made me lie face down near the fountain and massaged the back of my legs incredibly firmly as though he was trying to make impressions of my calves and knees in the marble. He did this with his forearms and it almost hurt. I didn’t think my knees could feel squashed but they did although the feeling soon returned. Maradona then flattened my feet against the marble — which made me laugh as it seemed to stretch my muscles and they felt so loose afterwards. Once again he stretched my arms above my head and massaged the tension out of them and then did the same with my legs. I felt like a salmon on a slab at the fishmongers; I had no strength left, but I also seemed strangely relaxed. Disappointingly, he indicated that was all there was. “Don’t forget to give me tip after shower,” he said. “After changing upstairs,” I said, not feeling that his approach was necessary. I went through the steam room door and turned right. There were three showers, plus some urinals and four toilets. The hot shower water felt so cooling and I let it play over me for five minutes. Afterwards, I discarded the towel I had been wearing, which felt like an old friend by that time, and I was then given three new towels by another attendant. He wrapped the first around my legs quite tightly, covered my torso with the second, and gave me a fetching headdress with the third, so that I looked like a very colourful version of Peter O’Toole in Lawrence of Arabia. Before getting changed, I sat down for about five minutes and thought about the whole wonderful experience. Walking in the towel was quite difficult — I felt as though I had tight-fitting skirt on — so I went slowly up the stairs one at a time. I opened the door to my room, dried myself, and got dressed. I gave a tip to Omar who seemed genuinely surprised and shook my hand profusely. I then went downstairs to find Maradona who was pleased with a 5-Lira tip. 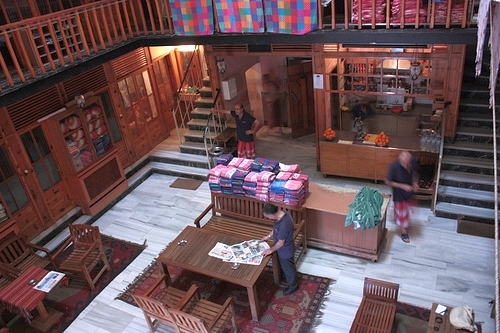 Cemberlitas is probably the best place to go if you’ve never had a Turkish Bath before. The staff are used to newcomers, everything is very straightforward to find and the steam room is not unbearably hot. I felt a spring in my step as I bounded up the steps out into the evening warmth and headed for a herbal tea in a local café. I felt incredibly clean, all my limbs seemed very supple and my back and lower legs felt loose and were none the worse for wear after my encounter with the Turkish Maradona. Julian’s writing has been featured in The Globe and Mail, Fate Magazine, Vancouver Sun, Northwest Travel and GoNomad.com. Julian’s photographs have appeared in travel guides by National Geographic, Thomas Cook and Rough Guides.